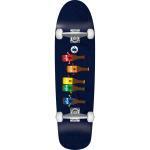 If you're new to skateboarding then buying a complete skateboard is a great place to start. All skateboards in this section are built up and ready to ride. All the components; skateboard deck, wheels & trucks are all compatible with custom parts, so if you stick with it and want to upgrade, you can buy new components without having to replace the whole set-up. We would recommend the Enuff Complete as the best complete skateboard for beginners or those on a budget or for bigger name brands we also have completes from Anti Hero Skateboards, Real, Santa Cruz Skateboards & Primitive Skateboarding.